Do we really want vendor lock-in with e-book readers? The Kindle e-book reader is, by almost all accounts, a great device. Amazon’s recent fumble with two George Orwell books notwithstanding, almost everyone who I’ve spoken to who has one loves it. 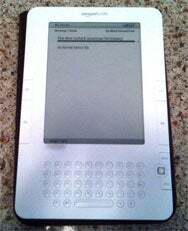 It’s portable, it’s convenient, the books can be quite inexpensive, and the e-paper display doesn’t wear on the eyes or wash out in bright light like a laptop or cell phone display. But Amazon is doing the same thing with the Kindle that Apple did with the iPod—it’s locking out other vendors from using the same content. Just as Apple did with the iTunes Store, before it removed its FairPlay DRM technology. Amazon requires you to use either a Kindle device or Kindle software in order to access its content. While the Kindle itself allows you to open some other file formats, the stuff you buy and download for the Kindle (and Kindle software) from Amazon.com is encoded in a proprietary DRM scheme—AZW files that only Kindle can read. This means you can’t use another company’s e-reader in order to read content you’ve bought from Amazon. If that sounds familiar, it should: It’s the same scheme Apple had with the iTunes Store. Prior to Apple’s removal of DRM from iTunes music, any song that you bought could be played back on iTunes for Mac OS X or Windows, or on the iPod. But forget about using other portable media players. None of them would work with iTunes music. But vendor lock-out concerns me, because it limits consumer choice to only what the vendor wants to provide. By enforcing its own AZW format instead of using an open standard supported by other e-book readers, like EPUB, Amazon effectively prevents people from reading that content on any device besides a Kindle (or a device equipped with Kindle software). So far, Amazon has shown no interest in letting other e-book readers support the AZW format, either. But Amazon also did something recently that gave many consumers who read the story pause—it actually reached in and removed content from existing Kindles. It happened when an Australian publisher of George Orwell books, including 1984 and Animal Farm, realized only after the fact that it didn’t have the right to sell the books to American customers. Amazon reached in to those Kindles using its built-in wireless technology and deleted the offending volumes, and credited the customers—but the intrusion was unwelcome. Even Amazon CEO Jeff Bezos admitted in a blog posting after the fact that his company never should have done that. It certainly gets people concerned—if Amazon did it once, what’s to prevent the company from doing it again, even if the CEO says they won’t? Clearly, Amazon wants its content read on its device, although it’s willing to offer Kindle software for other platforms it doesn’t see as much of a threat—yet. And what we consumers are left with is the Kindle and everyone else, and an increasing balkanization of the e- book market as different corporations try vainly to cut a piece of the pie for themselves. Last Wednesday, Sony announced two new Reader devices which it expects to hit stores by the end of August, with one priced at $199—$100 less than the Kindle. Sony also reworked prices on its own e-book store so you can buy bestsellers and new releases for $10 a pop, bringing the service in-line with what Amazon sells bestsellers for. Barnes & Noble is in the act, too, having just launched its own e-book store. As with Sony, Barnes & Noble has tried to bulk up its collection by partnering with Google, which offers hundreds of thousands of public-domain books for free. Barnes & Noble has also teamed up with e-book reader maker Plastic Logic, which has not released a device yet, but is expected to, and plans to make it competitive with other vendor’s offerings, according to statements. Some pundits are saying that the race is over before it’s even begun—that Amazon has such a long lead with the Kindle and its own store that Sony, Plastic Logic and the rest can’t hope to compete. I disagree. I still don’t see a lot of Kindles in people’s hands. My suspicion is that this market is a long way from mature, and there’s still plenty of room for vendors to maneuver and for consumers to decide what kind of business model works best for them.